Year four life science worksheets help teach your child about animals, plants, and people. Our selection of year four life science worksheets help teach your child about living things in an interesting way. Your child can discover why people blush, why leaves change colour, and why cats purr in these fascinating year four life science worksheets. Try these year four life science worksheets with your future scientist. Experience some explosive earth science! Use this diagram to teach your child about the various parts of an active volcano. Help your child learn a little about endangered species and why they're in danger with this printable word search. Little gardeners, get to know your plants! See the cycle of a plant from its birth to adulthood, and read a bit about photosynthesis too. 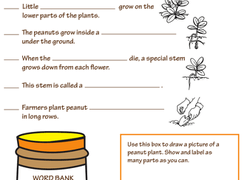 Help your preschooler sharpen his knowledge about plants with this colorful worksheet. He'll use the word bank to name the basic parts of a plant. Looking for a fun way to supplement your child's science learning? 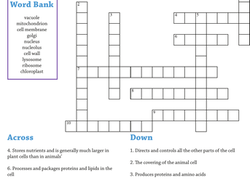 Try out a life science crossword puzzle! This one's all about ecosystems. Here's a fun way to review photosynthesis with your child! She'll show off her science knowledge as she answers questions to complete the crossword puzzle. The next time you're on a hike, be sure to take this leaf chart to guide you in identifying different types of leaves! In which habitat could you find a blue whale, a squid, and a shark? The ocean, obviously! 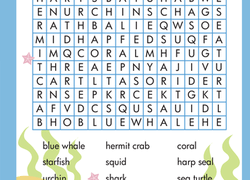 Have your kid find ocean animals with this word search worksheet. Cut out and complete this trophic level pyramid template! Test your child's barnyard animal knowledge with a fun word search. Which part of the flower attracts insects and birds? 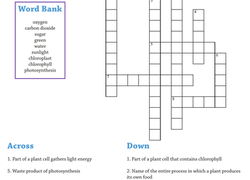 Kids show off their flower knowledge as they complete this fun crossword puzzle. Some people think alligators and crocodiles are the same, but there are some distinct differences. Check out this cool worksheet to learn what they are. Animal lovers can learn about sea creatures like sharks, tortoises and seahorses with this ocean habitat activity page, full of fun facts and a word search. As your child matches up the body systems vocabulary with the correct definitions, she'll boost her life science knowledge and have fun doing it! In which habitat could you find an arctic fox, a polar bear, and a snowy owl? 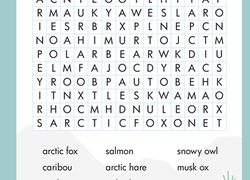 Have your kid find tundra animals with this word search worksheet. Maths meets real life when it comes to making healthy food choices. Check out the recommended daily guidelines, and create your own weekly menu! What has two legs and carries its baby in a pouch? 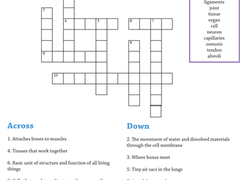 Fill in this crossword puzzle and learn some fun facts about two-legged creatures! Which comes first, genus or phylum? 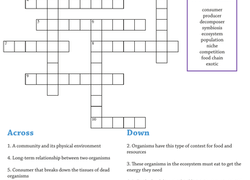 To complete this life science crossword, kids need to put the 9 levels of biological classification in the correct order. 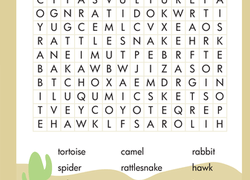 Kids find desert animals in this science word search. Animal habitat worksheets help students learn about life forms in different environments. As your child completes this science worksheet on the life cycle of a peanut, he'll get the chance to practise his sequencing, labeling, and drawing skills. 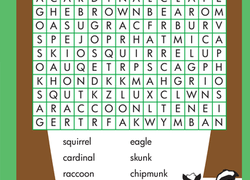 Kids find forest animals in this year four science word search. Animal habitat worksheets help students learn about life forms in different environments. Get a year three science worksheet that will challenge your child's knowledge of ecosystems while giving him a fun activity. These Valentine's Day cards will be the oddest and most unique cards your sweetie ever got! This fun worksheet is all about animal tracks of North American mammals. On his next hike your child can put his observation skills to work!